It was in the early 1960's, long before "recycling" and "reusing" became fashionable, when David Wasserman began digging trash cans in Eisenhower Park, Long Island, looking for "the right shade of red or green or yellow" to complete another Tin Can artwork. For years, he refused for any kind of public showing except for a website set up by his son, Steven, back in 1997. 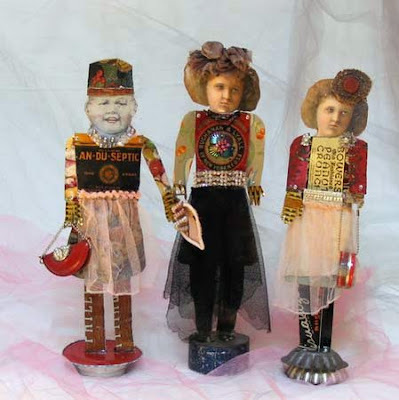 In the Spring of 1999, Wasserman agreed to let his son arrange an exhibition of his tin can art at the Tennessee State Museum. Sadly, he died of complications related to Parkinson's disease during the preparations for that show. The exhibit opened on December 7, 1999 and was held over until March 10, 2000. Here are five of Wasserman's most impressive creations, shown with exclusive high-resolution versions as taken by his son. 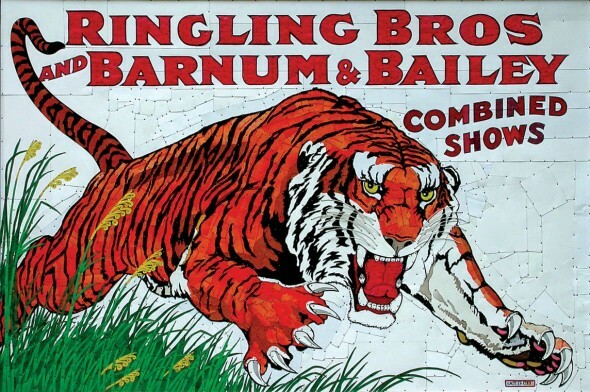 The Circus Poster (above) is a 72 inches x 48 inches tin masterpiece made from ginger ale cans and cut from many dozens of cans of Pathmark Orange Soda (see detail). According to Steven Wasserman, after this monumental work was completed his mom took a vow never to drink orange soda again. 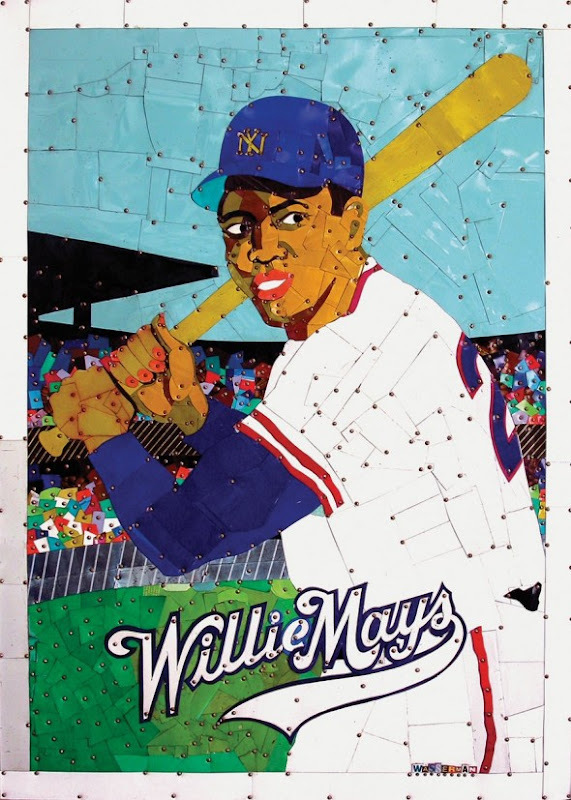 Based on a real baseball card and sized 21 inches x 30 inches the Baseball Card was Wasserman's first attempt to reproduce the human form out of tin cans and a great homage for legendary baseball player Willie Howard Mays of the New York and San Francisco Giants. According to Steven Wasserman, the owner of a leading New York art gallery offered his father a show if he would produce a dozen or more similar tin can "baseball cards." The gallery man was turned down because the purpose here was "to explore all the possibilities and challenges of creating 2-dimensional art out of metal" and that was already achieved. Cartooning was Wasserman's commercial specialty. 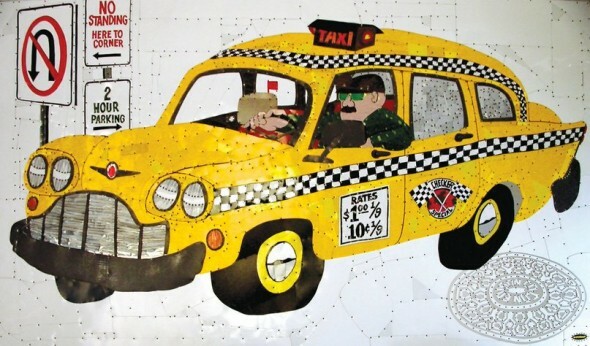 TAXI, a monumental 72 inches x 42 inches tin can cartoon, was made after a series of realistic pieces. 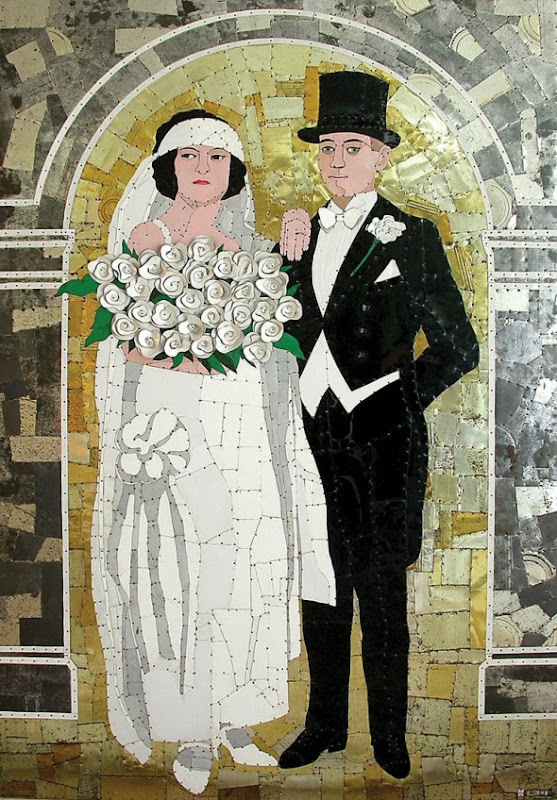 Check out Bride and Groom below (48 inches x 72 inches). 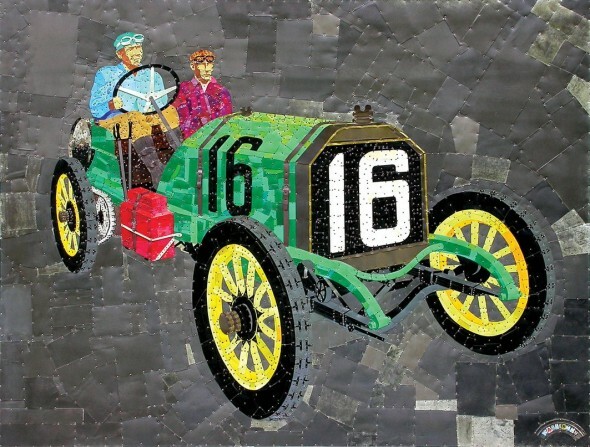 Number 16 (below) is a 63 inches x 48 inches piece based on a photograph of the 1908 Vanderbilt Cup Race winner. The work is displayed in the lobby of the Lane Motor Museum in Nashville. Want more of Wasserman's art? Contact Steven Wasserman and order a 8 1/2" x 10" 28 pages catalog with 43 full color reproductions and commentary by Bobby Hansson, Steven Wasserman, and Lois Riggins-Ezell (available "in limited quantities"). Following are 5 more fascinating examples of contemporary tin can projects and artists. It's not always a very good thing when business, commercial interests and pure art are mixing with each other but sometimes the results just speak for themselves. 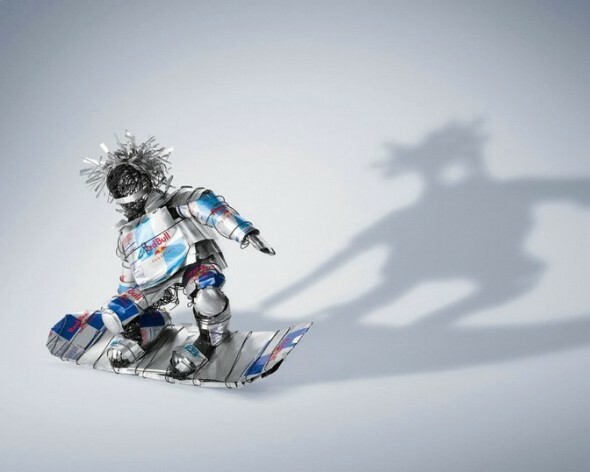 The Red Bull Art of the Can Competition is an international juried art competition in which International tin can artists use the Red Bull can as their primary medium. 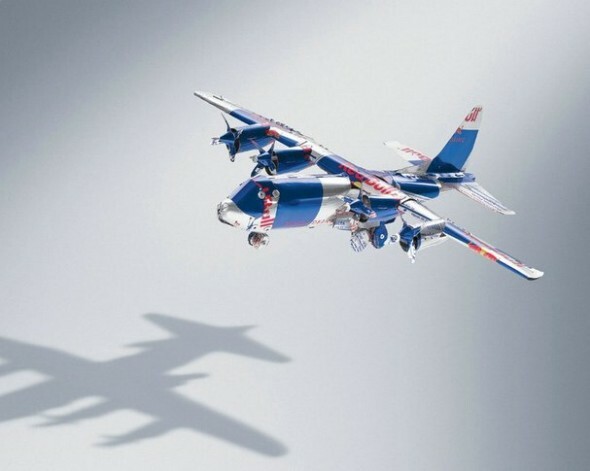 From spectacular Red Bull Snowboarder (above) to Red Bull Satellite and c130 aircraft (below) this show takes the raff up with nearly everything about tin can art technique. For many more photos of The Red Bull Art of the Can works, including high-res where you can clearly see details (such as this Purse and that Catfish) see artofthecan photostream on flickr. M.A. 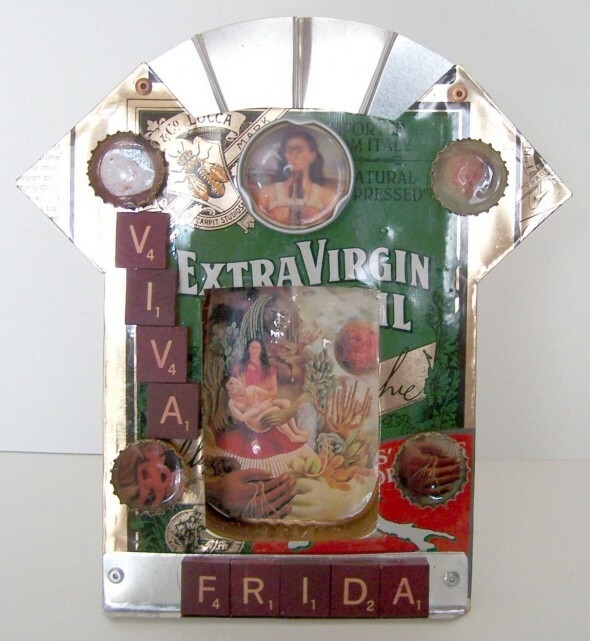 Enriquez, also known as Urban WoodsWalker has already been reviewed on cultcase with her spectacular "MONA" - a "Trash Chaos Vessel" made from newspapers and junk mail (see The Art of Junk: 7 Creative Approaches to Trash Reuse). 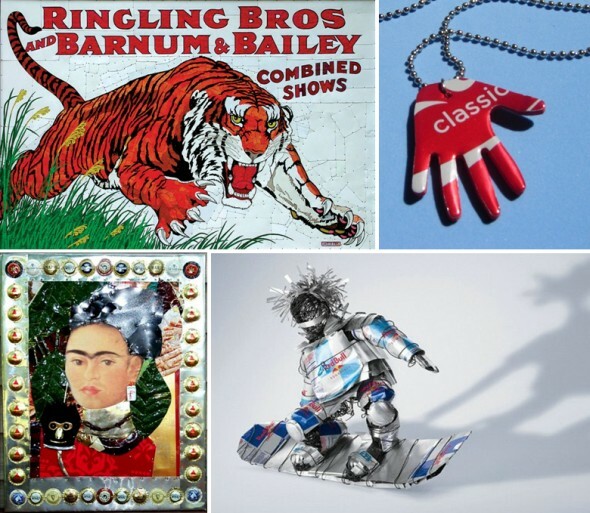 Her used aluminum necklaces are made of beverage cans. The cans are washed and then the hands are cut out. According to Enriquez the hands remind her of Mexican Milagros (also known as ex-votos or dijes) - religious folk charms that are traditionally used for healing purposes. 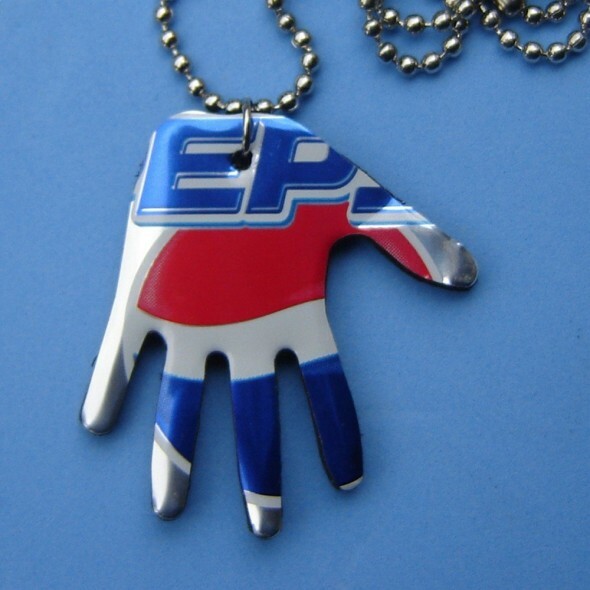 The above 1 3/4" x 1 3/4" item is named "Pop Art Aluminum Can Hand Necklace RESERVED FOR BRUCE". 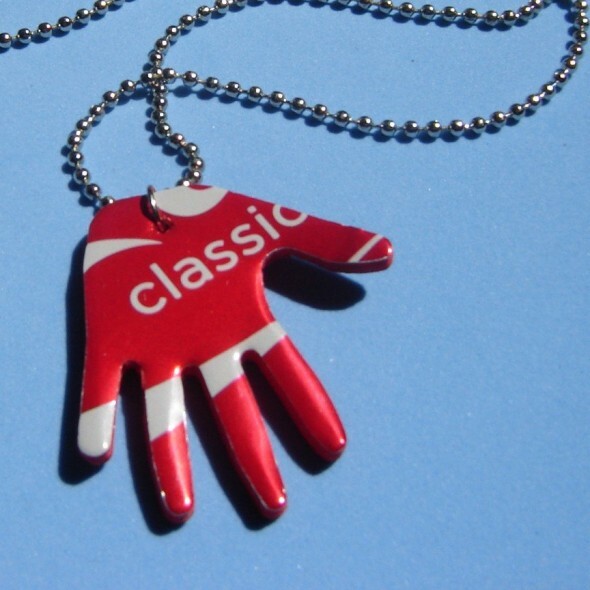 You can get yourself an "extremely similar" one such as the "Pop Art Aluminum Can Hand Necklace" shown below but not the Bruce one. There are no sharp aluminum metal edges, if you are asking yourself. 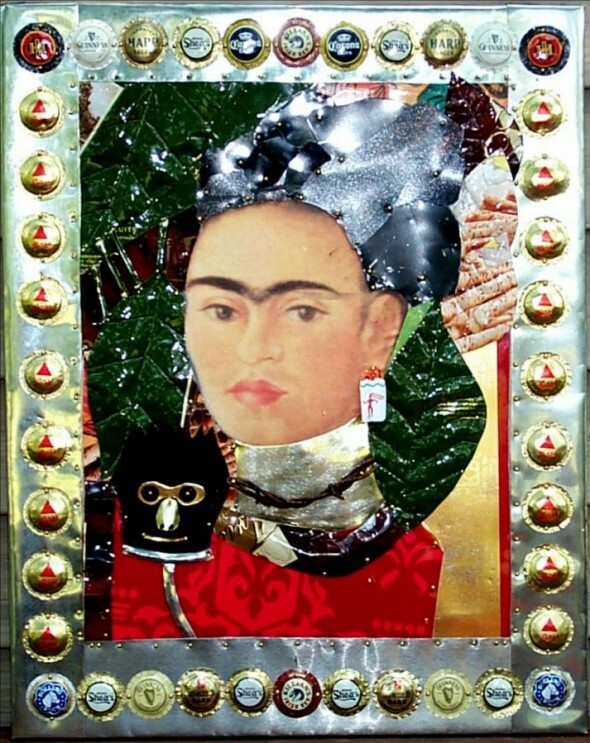 Enriquez's work is for sale at her etsy shop. She runs her own blog urban-woodswalker.blogspot.com and is the Admin of the especially originally named flickr group Fan>TAB>ulous Aluminum & Tin Can ART (Strongly recommend). The Orlando Forge Metal Studio in Belmont, NY makes custom forged steel, decorative and functional ironwork using "the time-honored tools, techniques, and traditions of the blacksmith". Charles Orlando who founded Orlando Forge Metal Studio has been working as a blacksmith for over twenty years. He taught and demonstrated blacksmithing techniques to blacksmiths and ferries across the United States and Canada and teaches regularly at the John C. Campbell Folk. Amongst Orlando's other metal art works are reused tin can and other painted tin objects such as clocks, toys and musical instruments. Orlando's tin can works are included in the revised edition of Bobby Hansson's Fine Art of the Tin Can, 2005 (see Amazon). For more of his work see the Tin Can Art Gallery. 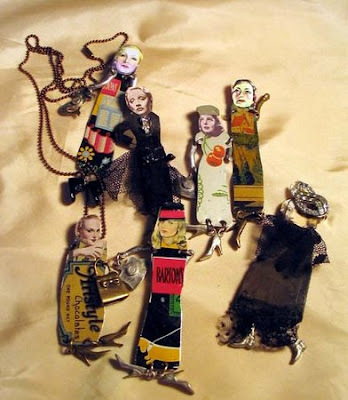 In the 1980s Janet Cooper turned rusty bottle cap collection into a jewelry business and sold jewelry to stores, galleries and museum shops in the USA, Europe and Asia and sold it four years ago. Today, Massachusetts artist and curator Janet Cooper reuses mostly vintage cans to make unique somewhat 2D somewhat 3D figures such as the above. Cooper's work also includes tobacco tags and other memorabilia items and has been showcased in folk art and contemporary craft museums. More reused art from Janet Cooper here. Most pieces at the etsy VintageBeadShop are either genuine antique, vintage, or made from the original old tooling from the early 1900's by family run shops that have been handed down through several generations. All are USA made -100% solid, pure brass. 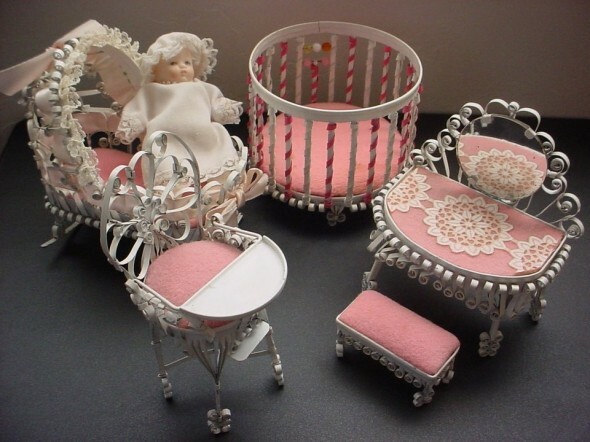 The above piece has a bit of a long title which kind of explains most of what we need to know about it: Vintage Shabby Chic Tin Can Art Nursery with Baby Doll Vanity Highchair Playpen Rocking Bassinet. 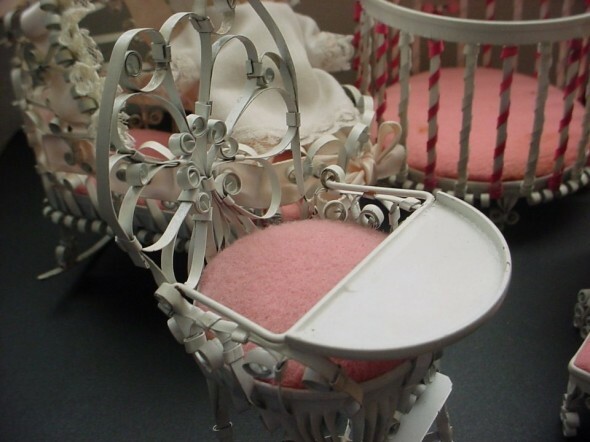 Here are just a few scraps: With the exception of "a few spots on the felt in the playpen and "some tiny rust spots on a few of the pieces" this set is promised to be in excellent condition for it's age as it was kept stored in china cabinets. Some measurements: Baby Doll: 4 3/4" L X 2" W from fingered hands to tiny little toes. Rocking Bassinet: 5" L X 5 1/2" H. Highchair with Movable Tray: 5 1/2" Tall X 2 1/2" W. More about this extraordinary set right here. Enjoyed this article? Don't forget to subscribe to our RSS feed! 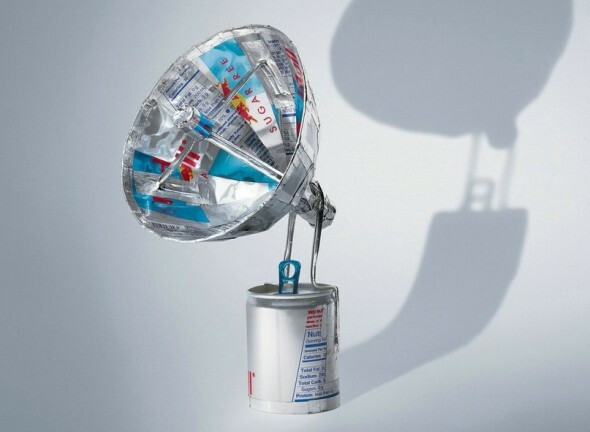 Know any cooler tin can art projects or artists? Be sure to post a comment or let us know here! It was the first day of the year 1896. "What's that large dark oval spot on her finger?" Professor Ludwig Zehnder of the Physik Institute at the University of Freiburg, Germany must have asked his teacher, observing the strange photograph of a woman's hand. Wilhelm Röntgen's answer must have been something along the lines of: "Well, it's the ring… my wife just never takes it off". The first ever X-Ray photograph of a human body part was taken on 22 December 1895, about one week prior to Röntgen's meeting with Zehnder. 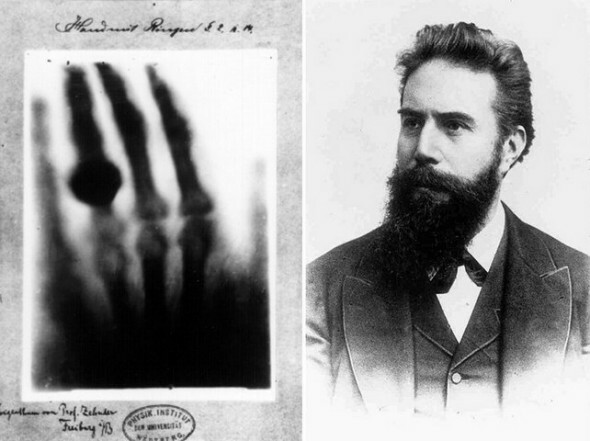 Hand mit Ringen (German for Hand with Ring, left below), had revolutionized the way medical prognosis is done, but Röntgen's photograph was not only a major milestone in the history of medicine. Hand mit Ringen was also the first step towards X-Ray as a unique genre of artistic photography. 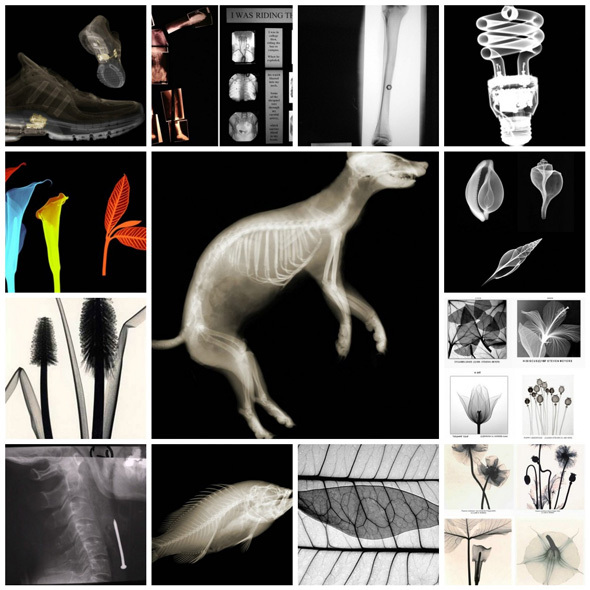 The following is a selection of contemporary X-Ray photography artists who all make spectacular images from everyday objects. While each of them has its own unique language, style or preferred subjects, all of them are hunters in a fascinating, sometimes shocking, inner-space reality. 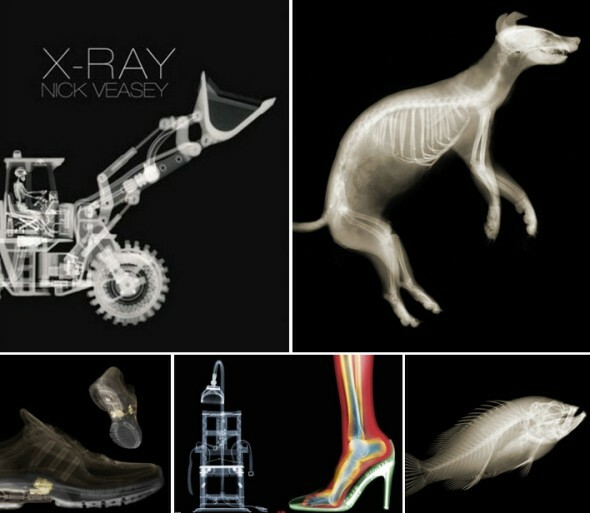 Published last month by Goodman Books, Nick Veasey's book titled X-Ray: See Through the World Around You is probably the most spectacular well-made work of X-Ray art the world has seen by now. For a bit less than $50 (Amazon) we can all enjoy the inner beauty of a female foot in a high-heeled shoe, an electric chair, hands typing on a laptop and other "insides becoming outsides" by this unique British artist. According to the Daily Mail Veasey, who uses a converted radar station in Kent for a studio, "passes x-rays through the objects he is photographing to create images on special film" and then uses "a 13-foot scanner to turn them into a digital file." 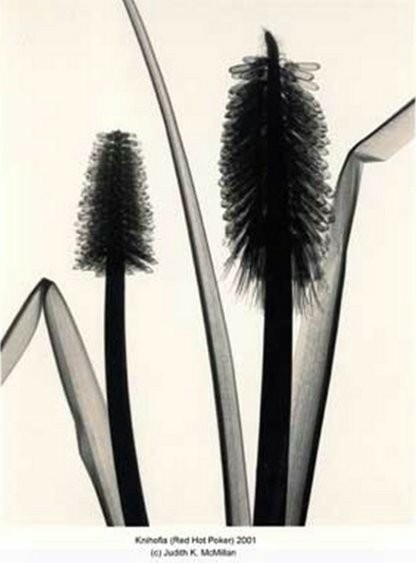 As described by Veasey in his book Intro: "Nothing gives me more pleasure than revealing the inner beauty of a subject. The unseen can be seen, the internal elements and workings revealed. The inside becomes the outside". Veasey's animal photos such as the above (fish) or the below (dog) are especially fascinating. 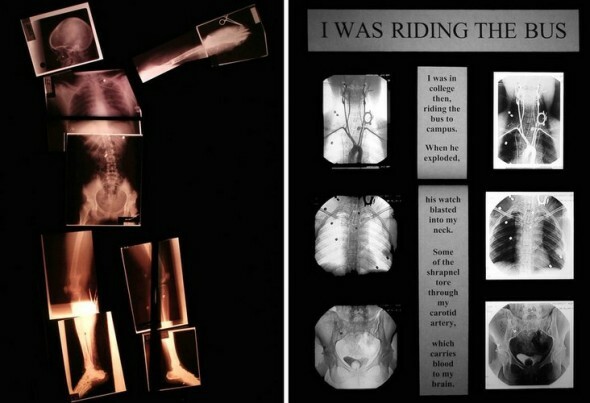 "When we see an x-ray of the human body" says Veasey in his website, "we react to that image with medical associations. 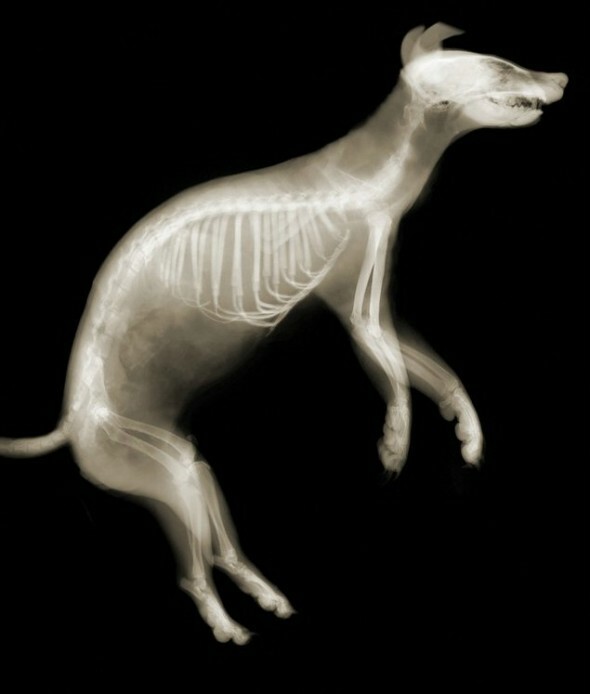 Animal x-rays however have a brutal beauty." 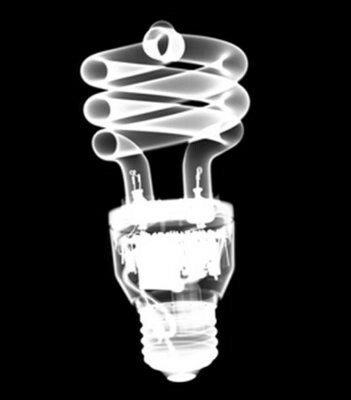 Veasey also makes custom per-order X-Ray images for various commercial clients, leading global brands that already realize the amazing visual qualities of his work. One of the most famous ones, known to every graphic designer all over the world, is the glower images used on the Adobe CS2 Suite packaging. 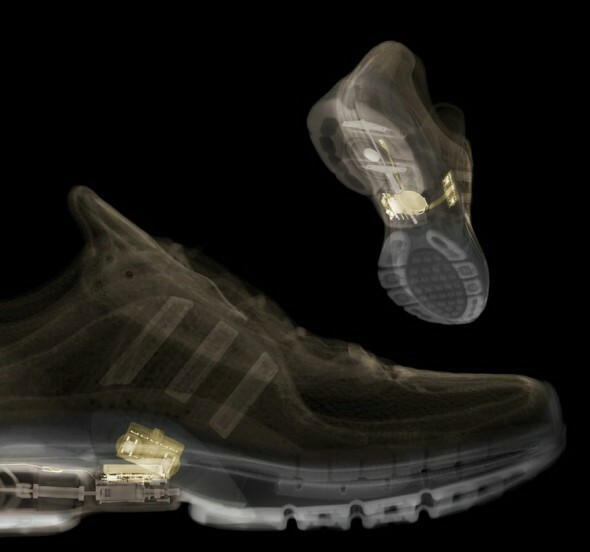 Another one, made for Adidas, reveals a sensor inside the sole of a sport shoe. 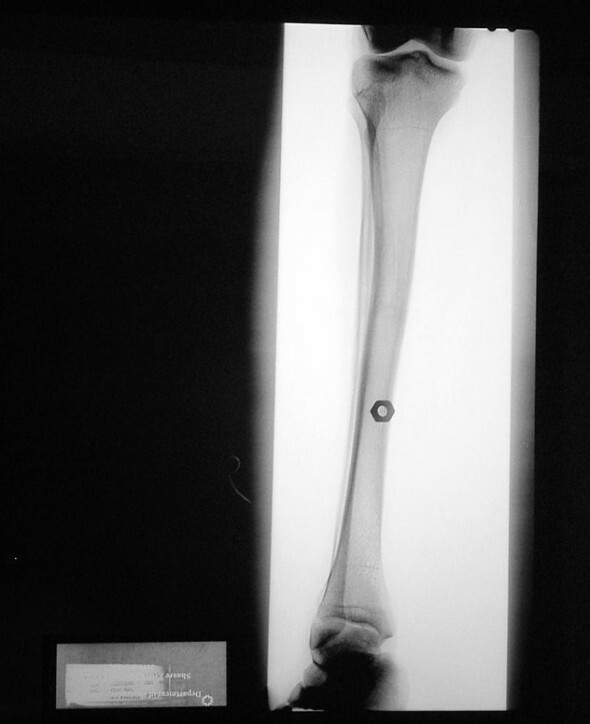 Inside Terrorism by Diane Covert is an X-Ray and CT documentary of terrorism survivors and a most powerful modern art piece following the footsteps of Mathew Brady, an American photographer who documented the Civil War with hundreds of death images. The idea for the Inside Terrorism project began in 2002 as a personal response to the massive terror wave that swiped Israel during the first two years of the Intifada. It was also meant to comment on "the way terrorism has been justified in some circles." According to Covert the X-rays and CT scans in this exhibit should be observed as "figurative images and portraits" deriving from "the desire to observe and describe reality with the most modern techniques available" but also from the "need to think and talk about" the by-products of terrorism. In Covert's words: "Terrorists pack their bombs with common objects - hex nuts, bolts, nails, watches - all meant for peaceful, utilitarian purposes. By blasting them into human beings, they create the madness of our times." If you happen to have an access to an X-Ray machine you might be interested with this 160 page 10 X 10.5” full color hard cover coffee table book. Dedicated to the use of ionizing radiation in producing art images Inner Beauty of Nature is, according to Myers, the first book to cover both the history of X-Ray photography as a form of art and the technical aspects of this craft with enough details to allow "anyone with access to an X-ray machine can duplicate the work." The book contains 30 color and 45 B&W X-Ray prints. As a retired Professor of Surgery at LSUMC and academic physician Bert Myers has always been interested in photography as a medium of art. In the 1980's, while using an X-Ray machine to make images of the very small blood vessels growing into healing wounds (microangiography), Myers had noticed some of the images looked like abstract paintings. 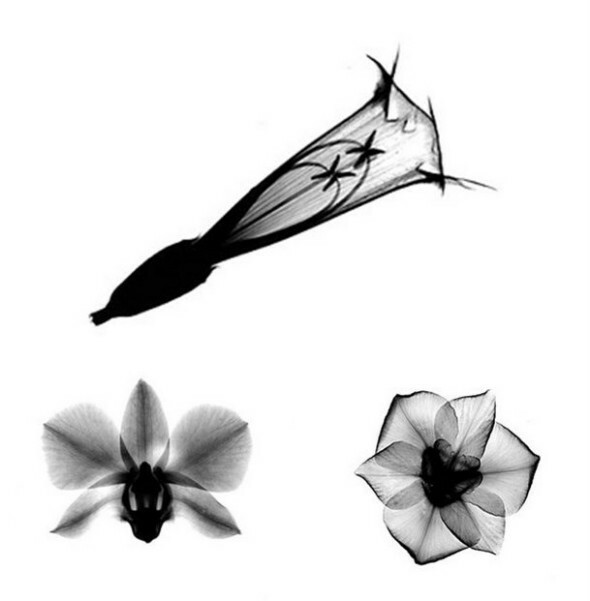 "I started to explore the uses of Xray as an art medium, thinking I was one of the first to use such methods. In reality I was not, as Goby, Hall Edward, Dain Tasker, Albert Richards, and William Conklin had preceded me, though I was not aware of that until years later. 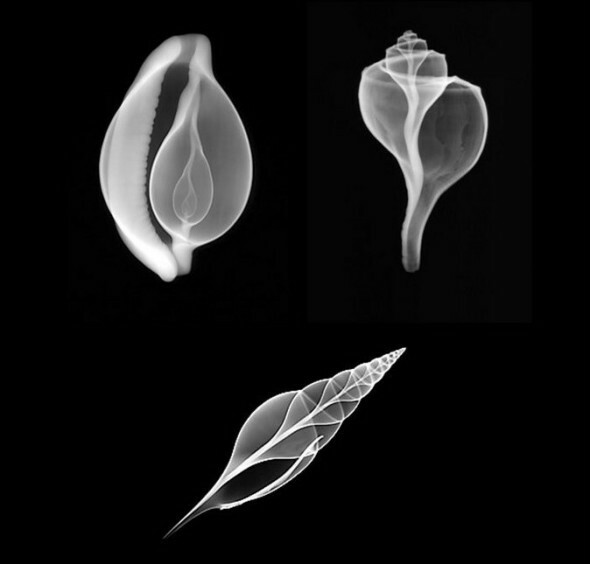 Myers subjects include various animals, mostly snail shells and fish (top on this chapter, left to right: Nautilus, Martin's Tibia, Giant Whelk), vegetable photographs such as of leaves and flowers (above: Morning Glory, Phalenopsis Orchid, Japanese Iris), minerals, man made devices such as the above Fluorescent Light Bulb. 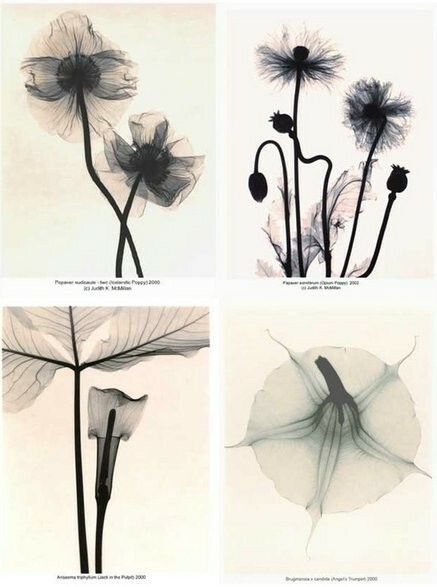 X-Ray images are all B&W but in the late 80's Myers began experimenting with X-Ray photo coloring techniques, using filters in the enlarger and Cibachrome paper. Most recently he has been digitizing the images and adding color in PhotoShop. The result, as can be seen in the below (left) "Three Lillies" and (right) Loquat Leaves Orange is astonishing to say the least. 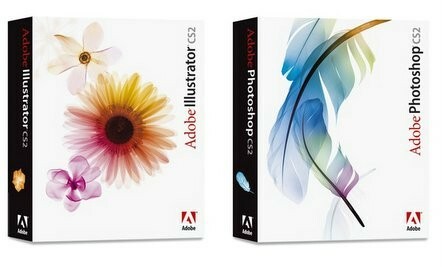 Adobe's decision to use flowers as subjects for their X-Ray styled cover was probably not a coincidence. Flowers and other plants are of the most popular within this line of expertise. 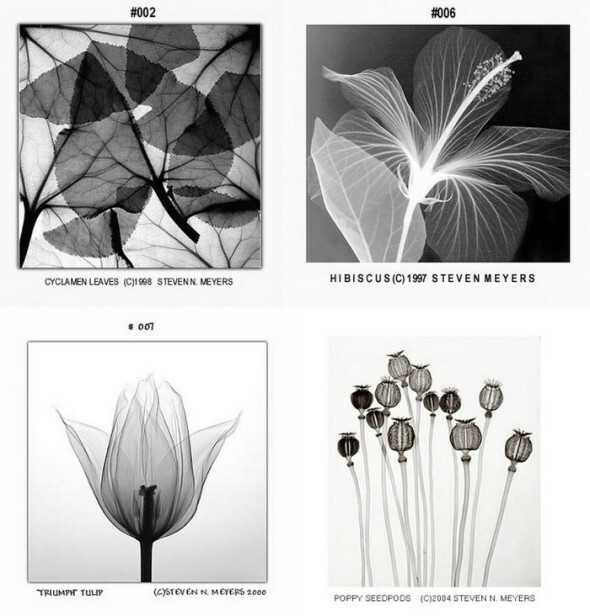 According to Steven N. Meyers a flower X-Ray photo specialist, the earliest floral radiographs were created over 70 years ago. 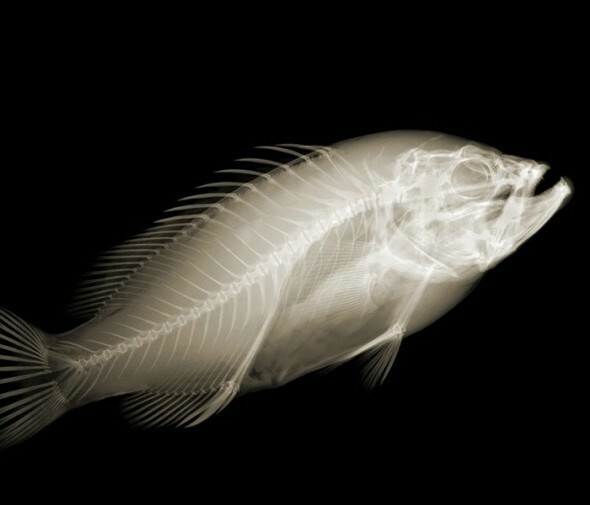 Yet, even today there are only very few radiographic artists in the world. 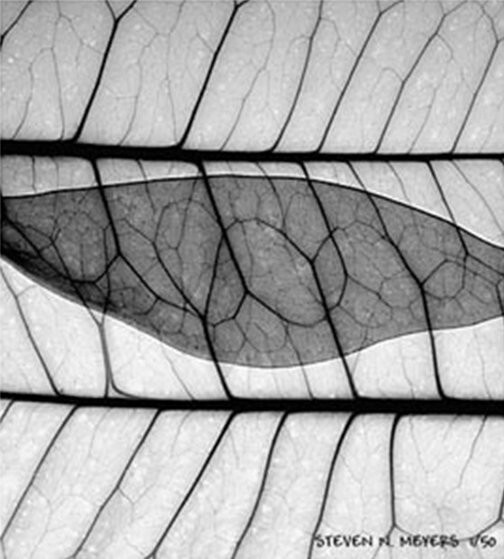 "By using x-rays instead of light, an unusual innervision can be revealed and nature shows us textures, details, and shadows that would otherwise not be seen" writes Meyers in his website. "Visible light is just a small part the electromagnetic spectrum, and falls between x-rays and infrared. 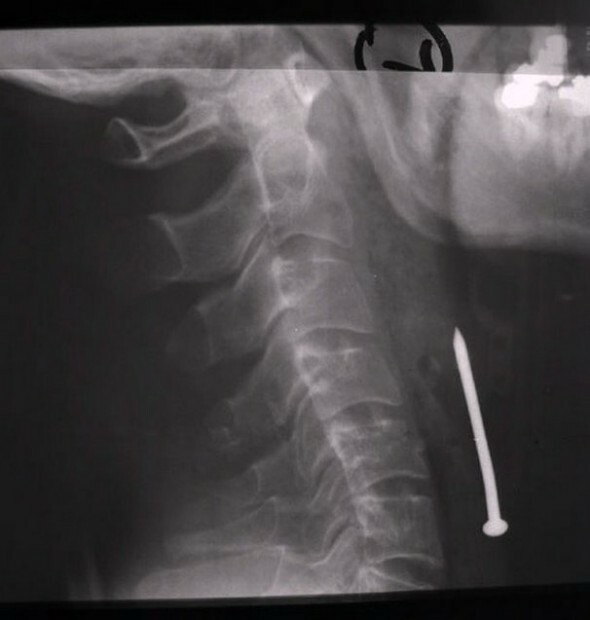 My x-ray images are a collection of negatives, positives, and solarized images, solarized being partly negative and partly positive at the same time." The above images were created by Meyers between the years 1998 and 2008. 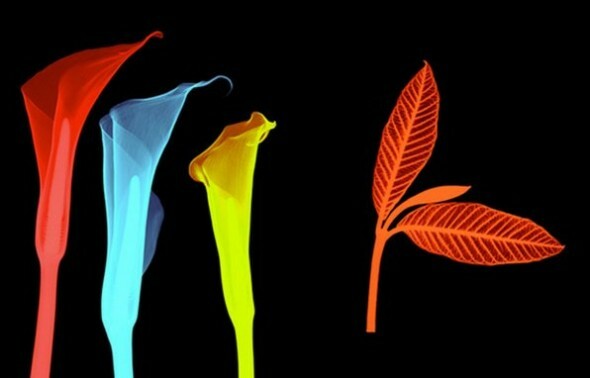 Photographer Judith K. McMillan uses an X-ray machine as camera to reveal the "beauty of natural plant forms invisible to the human eye". Ephemeral, eerie and extremely aesthetic, McMillan’s images include gladioli, poppies, water lilies, orchids, locust seeds and ferns. McMillan uses a special technique in which she lightly tones the prints created from the X-ray negatives. This chemical process produces a shift between warm and cold tones, creating a dimensionality in the overlapping layers. Thus, unseen microcosm emerges as "predictable, common and familiar is transformed into a world of newly discovered pleasures."